Ok so I have started to work much harder at my ballet and I am taking every class more seriously but I am compleat lay inflexible. What are some great stretches that will help me stretch out my back thies and calfs thanks..( I really want the I-Flex does this look like it would work. .you can find it at discount dance) Also I was doing a lot of research online about ballet and many people stress how hard it is to get professional and how basically only the select few have a slim chance, should I pay mind to this I do want to dance professionally even if it were an incredibly small company I love ballet so much. Also I desided not to go to a summer intensive this year and save for next year, any suggestions on where to go somewhere that will totally leave you breathless and what should I do to train to get there, I want somewhere that will help me cross the line from ok dancer to good dance. Also( sorry this is getting long) thank you for the advice you gave me earlier about how to not look down, i took that advise to heart and got my first solo variation Raymonda ( the slow one with lots of Bourrées) so thank you so much. One more thing can people that only dance with a studio and not a full year school ever advance professionally . Thank you for your message, it's great to hear from you again. I love to keep in touch and hear how you are progressing. I looked at the I-Flex and I know it exactly, because many of my professional ballet friends have one too. I think it's a great idea if you can get one and it will help progress your flexibility. of your stretches, because this is when your muscles are most warm. The quite basic stretches for your thighs and calves always works for me. You probably know them already, but for your thighs, you stand on one leg then bend the other leg in towards to bottom. This position stretches the quad and you can do it lying down too. For your calves, you can stand up and bend your front knee then put the other leg straight behind you in parallel to stretch the calve. 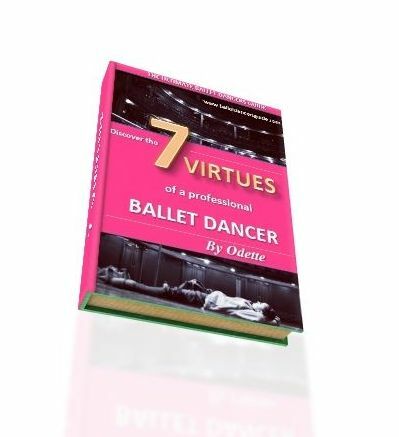 You are right to be aware that it is very tough to make it as a professional ballet dancer. In fact, no matter how talented you are, it is still hard to join a ballet company and stay there. It doesn't just depend on your ability, but your mental attitude as well as what a director wants in a dancer. Sometimes, you do just have to be in the right place at the right time to get your opportunity. I would say you have to train full time at some point to make it as a professional. It doesn't have to be from as young as 11 or 12, but especially when you reach 16 this is the crucial time to develop over the next years. Ballet companies will judge you on your talent and ability, but also where you have trained. They will look at your training and that is a factor they take into consideration. Therefore, I think it is important to study at a vocational dance school or have full time training somewhere. I would suggest applying for a wide variety of summer intensives, as you want to give yourself plenty of options. You can have a go for the bigger institutions like American Ballet Theatre, Joffrey, San Francisco. Or if you are willing to go abroad, then in the UK there is the Royal Ballet, Elmhurst School for Dance and Northern Ballet. Almost every ballet company or school will have a connected summer school so it depends on where you want to go and where you get accepted. I hope this answers some of your thoughts. Please keep in touch!